I’m about to say something very controversial. Sacrilegious, even. Well, at least in homestead circles. Like always, a part of me is stoked for spring. STOKED, I tell you. The seedlings are growing in the basement, and I walk through the dormant garden about once every 3 days dreaming and planning. 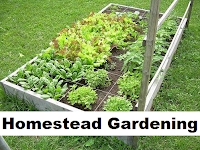 But a part of […] The post How Much to Plant Per Person in the Garden appeared first on The Prairie Homestead.